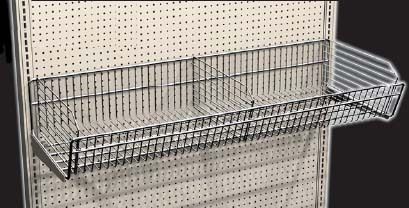 The Lozier Continues Basket is compatible with Lozier wall and gondola 4' or 3' wide shelving systems, 8" high with 6" sloped front, features dividers and ends, connected to Lozier gondola or wall shelving systems with brackets sold separately. Reversible when brackets are in down slope position, two position flat and 17 degree down slope, optional dividers adjust on 1" on-center, uniformly distributed load of up to 400 pounds. Basket depths available in 13", 16", 19" & 22"